It’s been a busy year thus far in 2018 at Jarrett Walker + Associates! We are engaged in major projects in cities across the U.S., Canada, and Europe, and we’re also excited to announce the relocation of our East Coast office to Arlington in the D.C. metro area. This will enable us to more easily serve our clients located in cities on the Eastern seaboard, and throughout the South and Midwest. Learn about some of the highlights of our recent work below. In Richmond, the network redesign plan JWA developed for the City of Richmond and Greater Richmond Transit Company (GRTC) in partnership with Michael Baker International was implemented in conjunction with the region’s first BRT line, the Pulse, in June 2018. You can learn more about this project by reading Jarrett’s post over at the Human Transit blog. Over the last year, we’ve been assisting Ireland’s National Transport Authority (NTA) develop a new network design for the capitol’s extensive and very heavily used bus network. This project is part of the agency’s larger BusConnects program. Without an underground metro system, the commuter, light rail and bus networks handle a huge portion of the region’s trips. 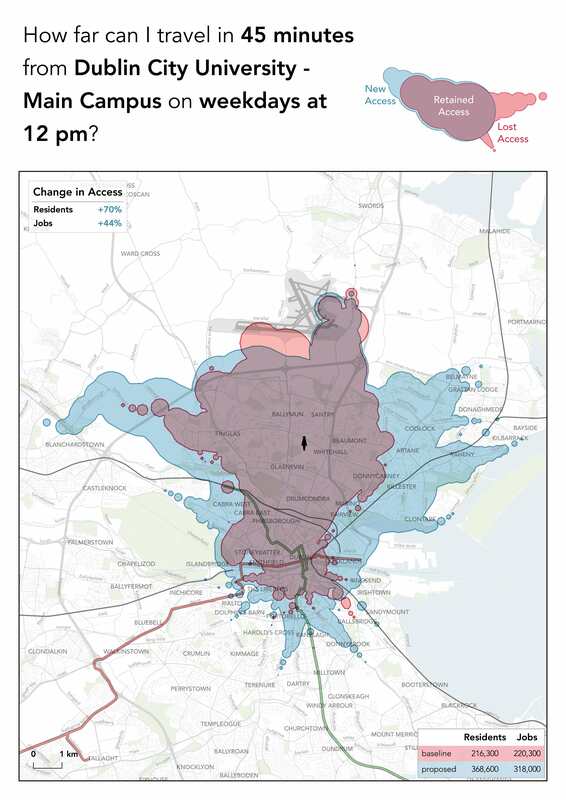 This isochrone map shows an example of the type of travel improvements this plan is designed to produce, with the blue area of the map highlighting areas that would be newly accessible in 45 minutes of travel time from Dublin City University. Find out more about this exciting project on Human Transit, or at the project website. The network is out for public comment now, with revisions to come later this year. Finally, our work over the past year for SEPTA in Philadelphia produced a report, released in June. This report makes no recommendations. We studied the network in great detail, and then made statements that all implicitly start with if. We present options, show their consequences, and invite the community to think about the trade-offs these options imply. The next step that we recommend is to encourage some public conversation about these and other choices, before a recommended network is designed. Our work has ended on this project, but we certainly hope to be involved in the future. In the second half of 2018, JWA will begin work on new transit planning efforts in several cities, including Tucson, Savannah, Salt Lake City, and here at home in Portland. As always, we are thrilled at the chance to help elected officials, planners and public in each of these cities facilitate a robust conversation around their goals and options for public transit.